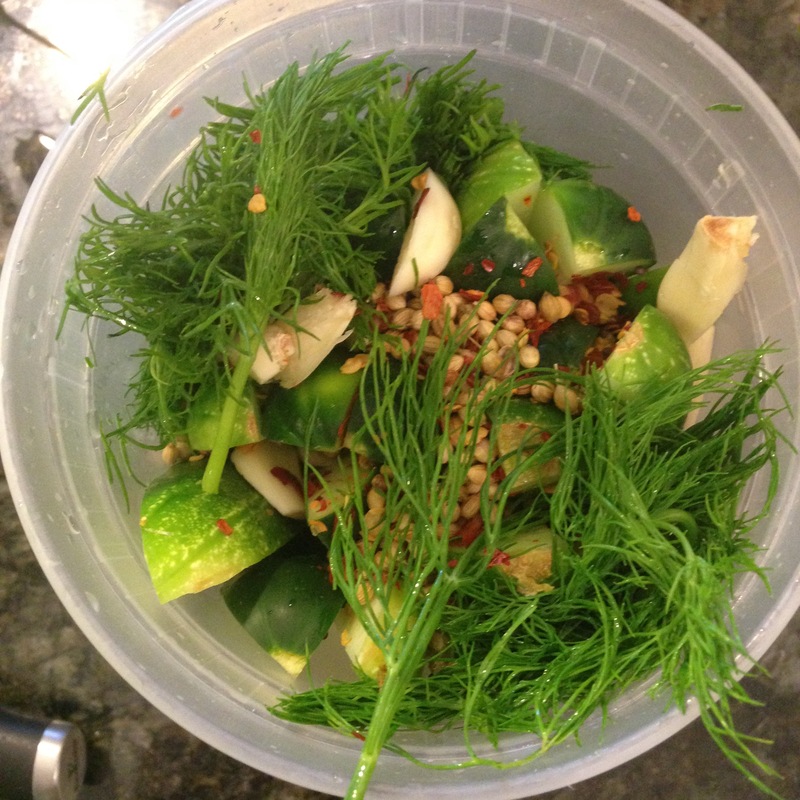 Dill Pickles – One Half Indian. My in-laws are still in the U.S. for another two weeks before heading back to India. I have had so many cooking lessons I cannot count, and will be posting lots of awesome recipes from my Ma in the coming weeks. However, since we are approaching 4th of July weekend (and since I found some awesome pickling cucumbers in the grocery store), I thought I would post a tasty American staple- dill pickles. As a kid, my sisters and I loved dill pickles. We would eat them as a snack and then fight over who got to drink the pickle juice at the end (so healthy, right?). As an adult, I am a bit more picky about my pickles. I like them to have a strong dill flavor, a slight spice, and a snap when I bite into the pickle. This pickle recipe is everything I want in a pickle and more. Also, no need to can it or wait for long periods. This recipe is ready to eat in 24 hours and will keep for a month or two in your fridge. My pickles will not be lasting past 4th of July weekend. Tip: Be sure to use “pickling cucumbers” or sometimes called “kirby cucumbers.” If you use regular cucumbers, your pickles will be soft and won’t snap when you bite into one. I randomly found pickling cucumbers at a Food Lion here in Durham, but I don’t think I can count on that in the future. Whole Foods or other specialty grocery stores generally carry this type of cucumber. 1. Combine the vinegar, salt, and sugar in a small sauce pan over high heat. Stir until salt and sugar are dissolved. Transfer the liquid to a bowl and whisk in the cold water. Refrigerate this mixture until chilled and ready to use. 2. Put the cut cucumbers int two cleaned 1 quart jars. Add coriander, garlic, mustard seeds, red pepper flakes, and dill to the jars. Top each jar with the vinegar mixture. 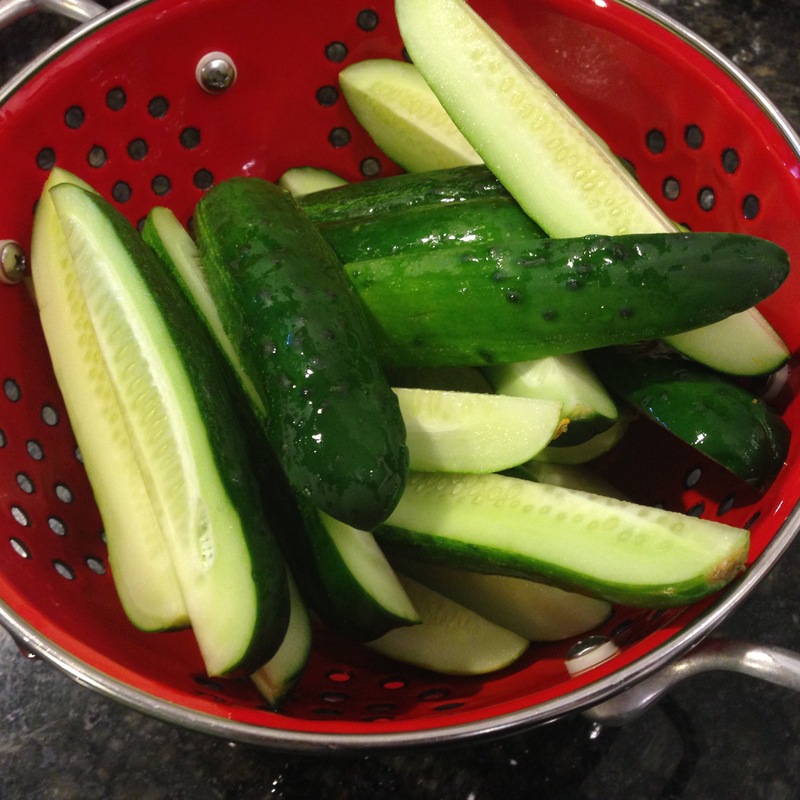 If your cucumbers are not covered with liquid, add a bit of cold water until the cucumbers are covered. 3. Refrigerate the pickles for 24 hrs before serving. Store the pickles in the fridge for 1-2 months.